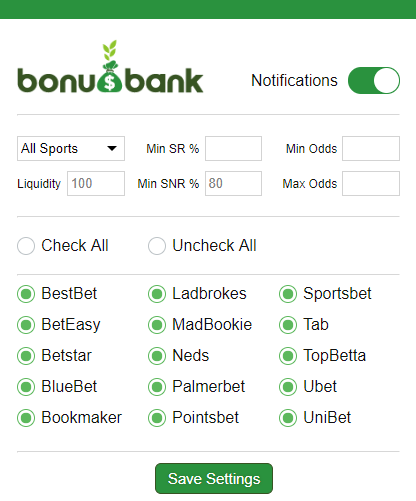 Our mission here at bonusbank is to make it as easy as possible for our members to maximise their matched betting profit. That is why we created the ATM Oddsmatcher software. The ATM removes the need to spend hours each week trawling through betting markets looking for the best place to use a bonus bet. Instead, members just need to filter the software to meet their needs and the best option will appear instantly. But what if the best option still isn’t good enough? With some bookies it is pretty easy to find selections that will give you 80%+ returns on your bonus bets, but that isn’t the case for all of them. There are certain bookies where finding a 75% match is like trying to find a polar bear in a snowstorm. They’re probably out there somewhere, but you’re unlikely to find them without the right guide and a lot of patience. ATM Alerts is a chrome extension which constantly scans the ATM and then sends you a notification when a selection matches your criteria. If you want a 90% return on your Sportsbet bonus, Alerts will help you find it. If you have a bonus that can only be used on a certain sport, no problem. Alerts has you covered. The extension is always running in the background, looking for the best matches so you don’t have to. Alerts doesn’t only work with bonus bets. You can also run searches based on the SR value of a selection. This is great for completing turnover requirements, but it can also be used for arbitrage. If you enter a positive figure in the the SR field, the extension will send you a notification any time an arbitrage opportunity appears on the ATM. These opportunities appear several times each day, and offer users the chance to make risk-free cash. Arbitrage isn’t recommended for everyone though, only those who have already been banned from bookmaker promotions. Like all of our tools, ATM Alerts is a work in progress. We are always looking for things to add or improve that will make matched betting even easier for our members. So if you have any feedback about ATM Alerts please let us know. Our premium membership costs $47/month. Hey guys, wondering if any plans to extend notifications to dutching software to alert when a profitable Dutch? I was wondering if this is progressing at all? I think this would be really useful. We haven’t started on this yet, but we do have a big announcement about Alerts coming very soon. Hi Nico will this extension work on Firefox somehow? No, it only works with Chrome. You should be able to edit the notification settings on your computer. How you do that will depend on your operating system. If you google “edit notifications mac” or “edit notifications windows” you should find instructions on how to do it. Hmmm. Good idea, but i’ll have to have a think about how we could do it. It would probably require changing the ATM rather than changing Alerts. Leave it with me. Are you looking at adding horse racing to your oddsmatching software? It is something that we hope to add in future, but there is no timeline for it at the moment. Our HorsePower software can help with profiting from racing promos and completing turnover. Nico – does the alerts function enable you to receive a mail when certain criteria appear? Or is it only a notification on the webpage?